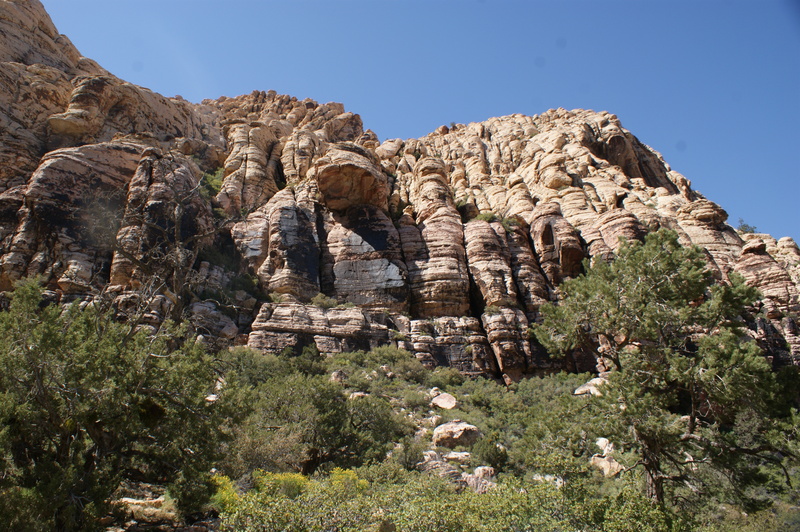 On Wednesday (4/15), we headed west to Red Rock Canyon National Recreation Area. 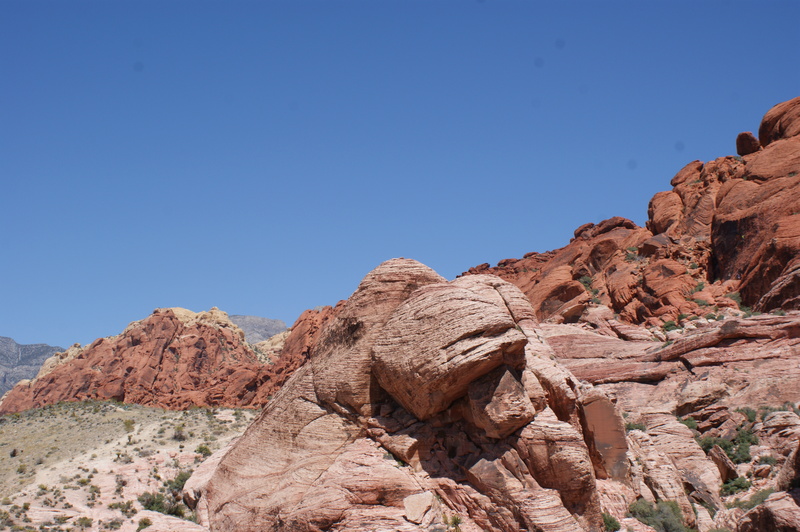 Our first stop on the ten-mile loop road within Red Rock Canyon was a formation of pink, red and yellow sandstone called the Calico Hills. 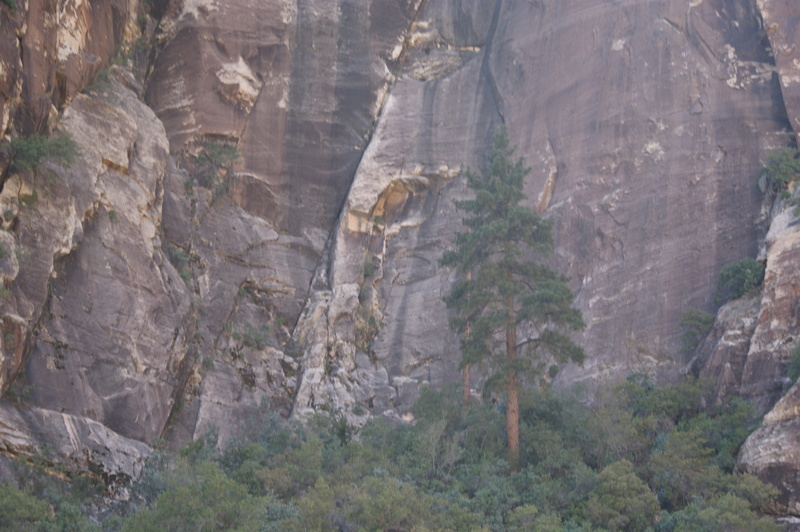 Nice view of the sandstone. My mom and sister in the Calico Hills. 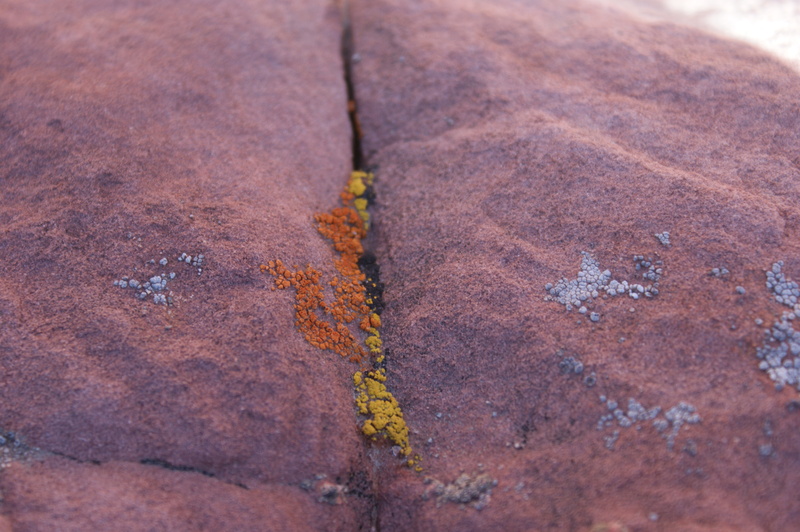 yellow, orange and grey lichen. 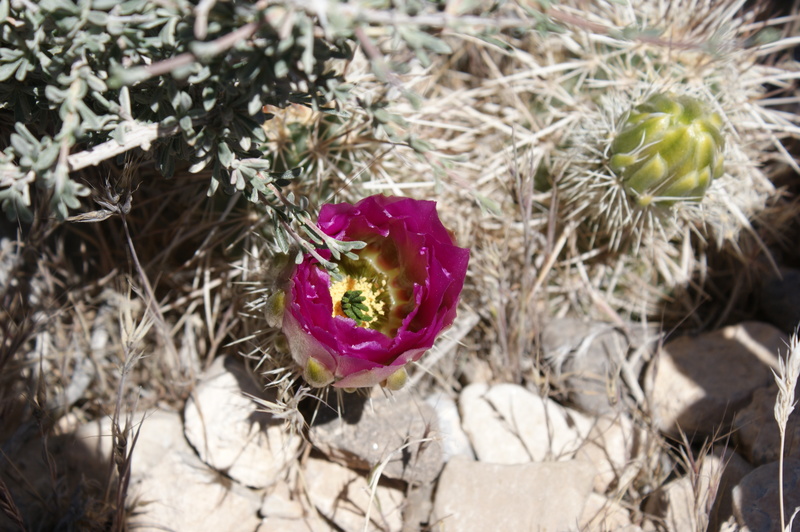 A cactus, possibly a cholla, with lovely magenta flowers. 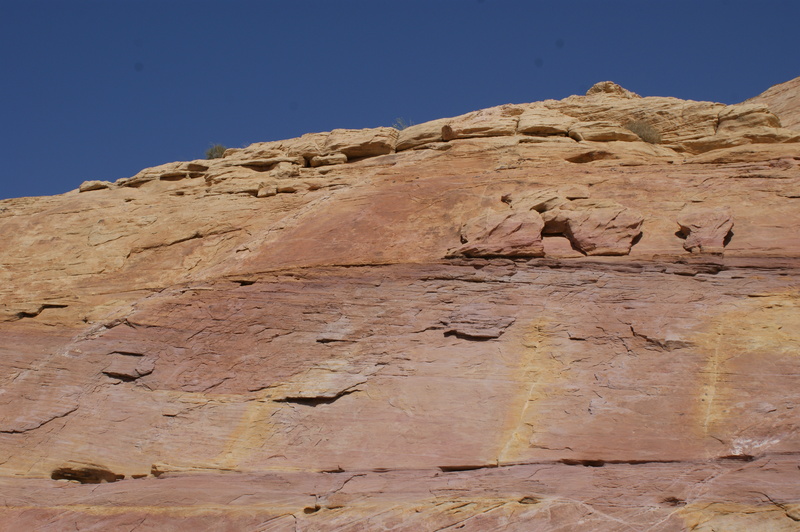 After that, we continued along the road to the next trailhead, near the edge of the yellow sandstone, where there was once a small-scale sandstone mining operation. We hiked a bit away from the road here, but not too much. Evidence of sandstone quarrying in the early 1900s. 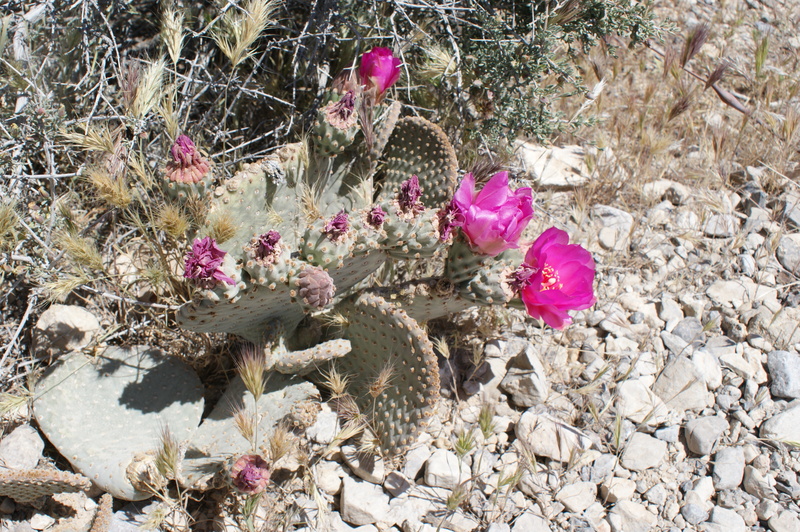 More cactus flowers (prickly pear this time). Me taking the above picture. 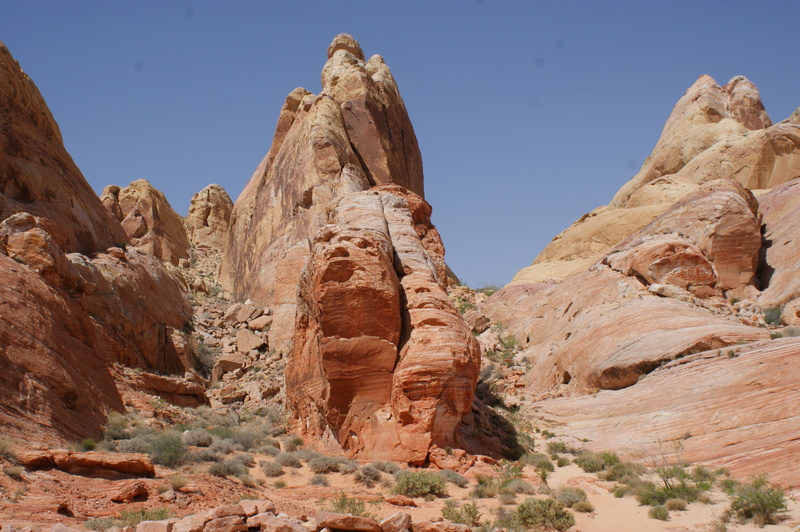 Next, we continued farther along the route to a picnic area, where we ate lunch, and from there to the trailhead of the Ice Box Canyon trail, so-called because it is relatively cool, not because they make refrigerators there or something. Trees show this area is rather more moistureous. The view back to our previous location. 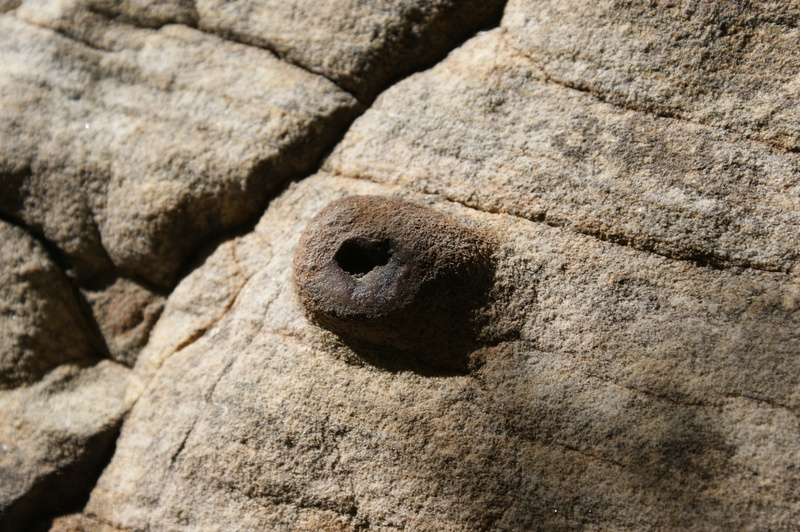 Hematite nodule embedded in sandstone. 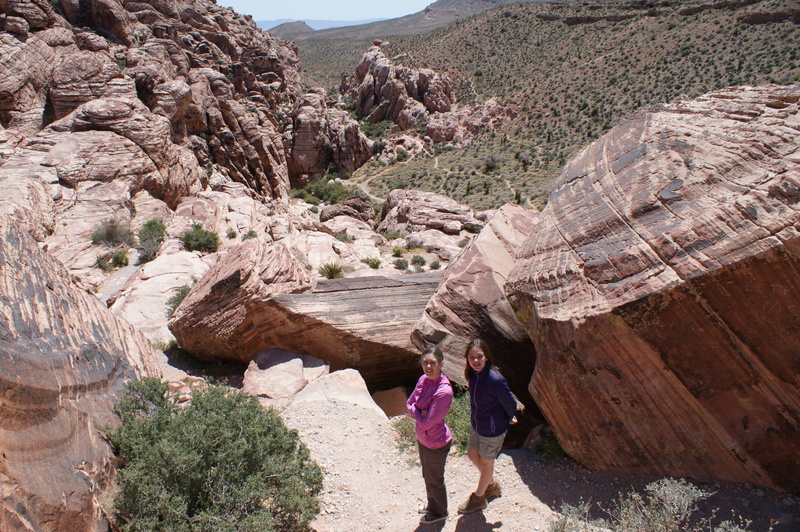 After that hike, which was our longest of the week so far, we left Red Rock Canyon and drove back to our hotel. 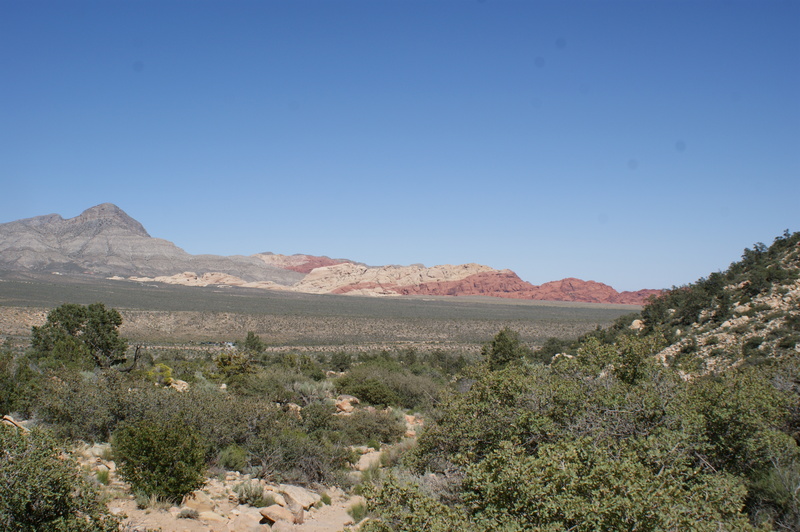 We had a great time at Red Rock Canyon, but it could have been much better if the map we had had been a hiker’s map instead of a scenic driver’s map, which was what was provided for us. But, we all had fun anyway. 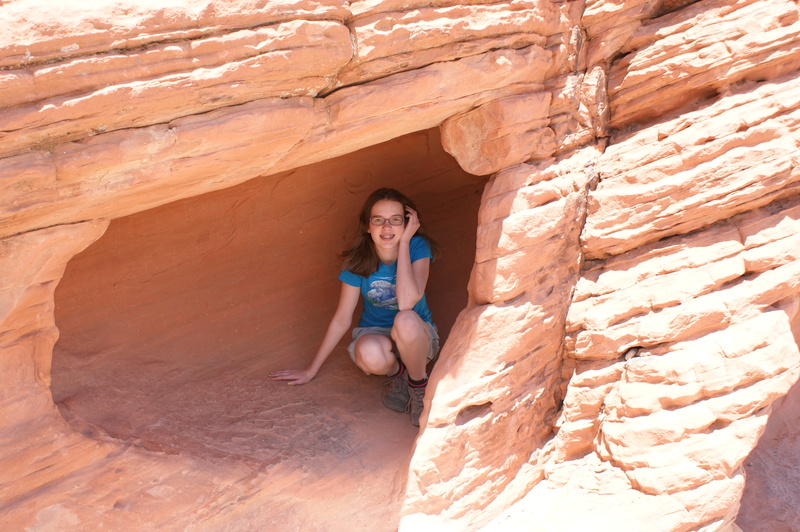 Last week, my family and I were in Nevada, because my dad had a conference to be at for work. 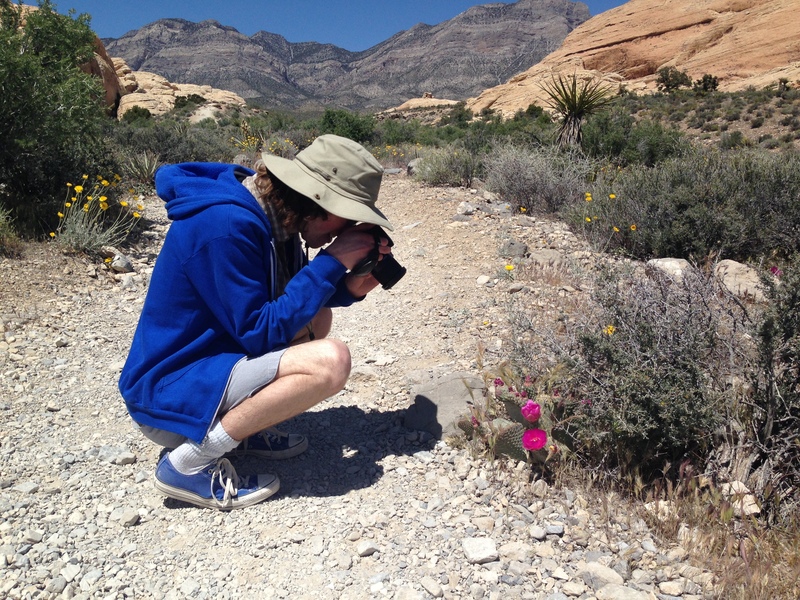 The rest of us, while he was busy working all day, went hiking in the Mojave Desert. 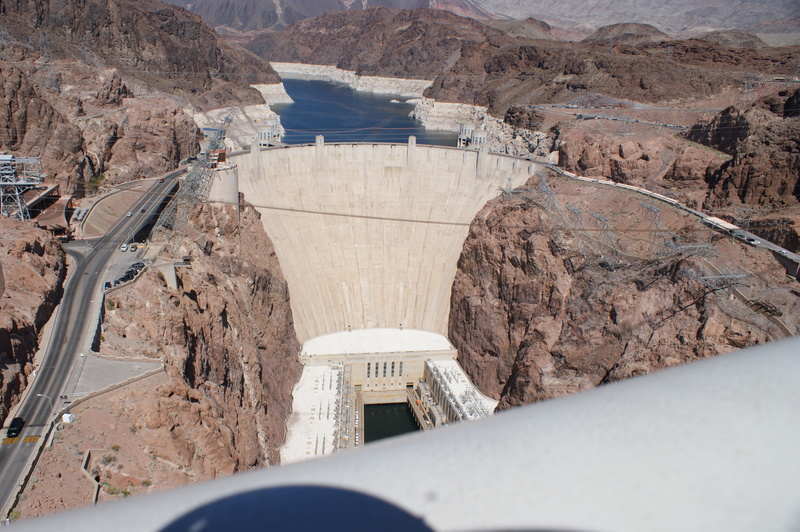 On Monday (4/13), I was ill with a horrible cold, so instead of hiking, we went to Hoover Dam. That’s one big wedge of concrete. 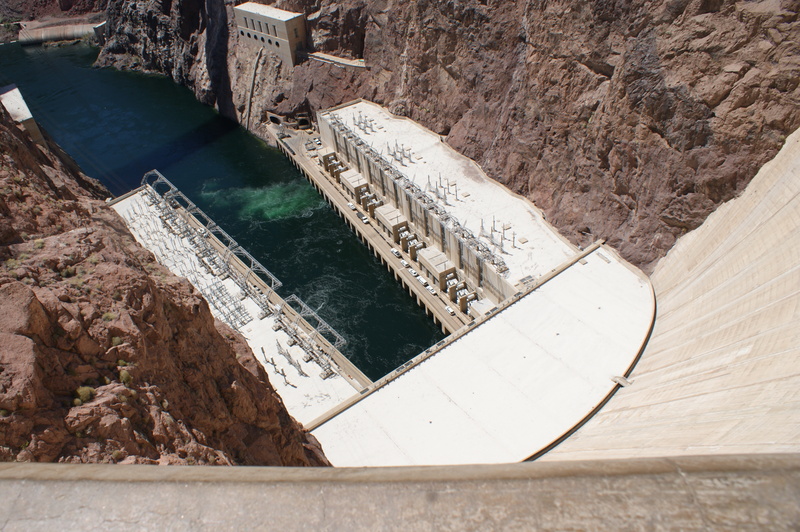 We walked out along the top of the dam, examining the sights. A penstock tower with a clock (blue square) showing Nevada time. 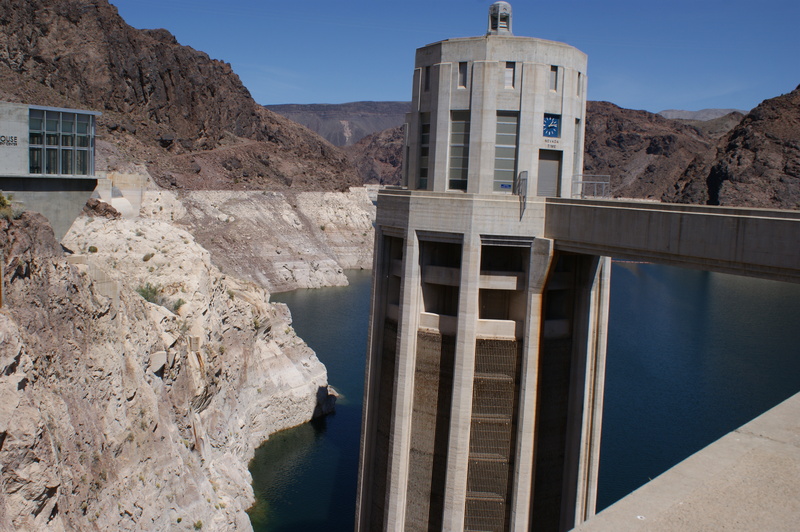 On either side of the dam, there is a clock on one of the penstocks showing Nevada (Pacific) and Arizona (Mountain) time. 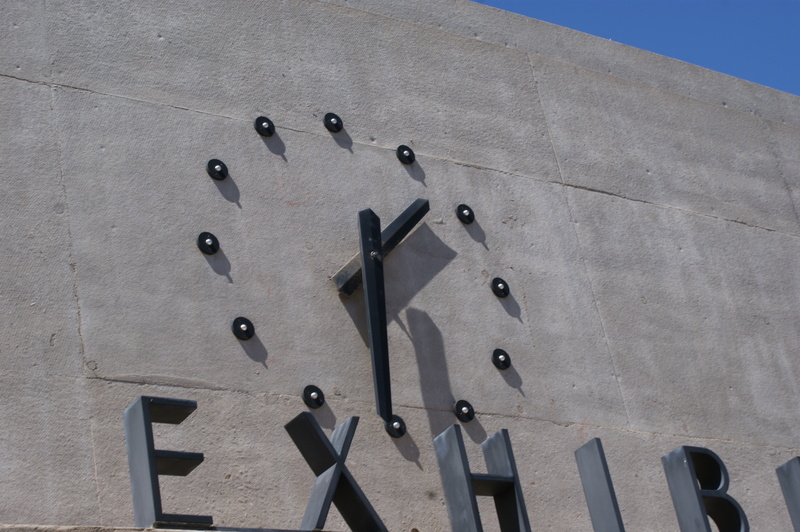 Because Arizona does not observe DST, both clocks showed the same time. Yet another clock, this one on the exhibit hall. 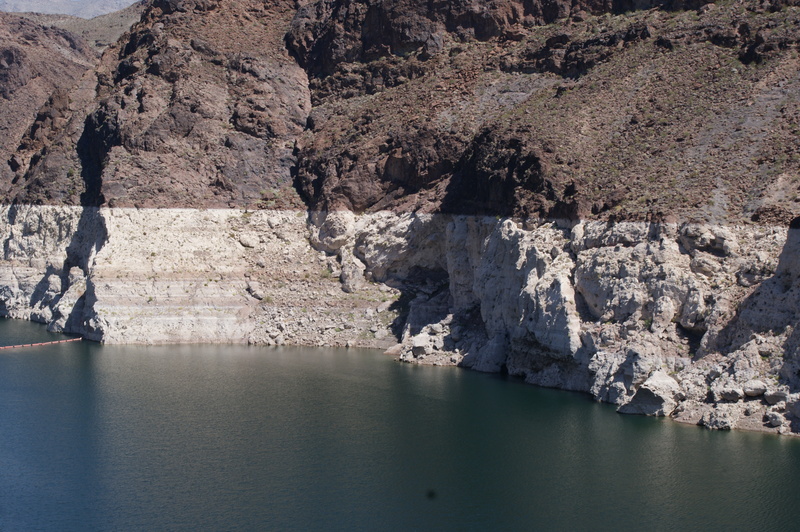 The Arizona side of Lake Mead, showing how high the water can get. 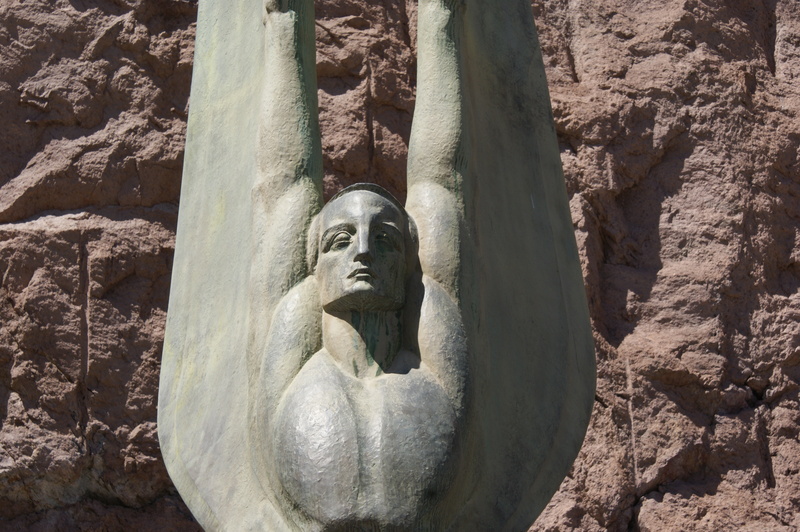 One of Oskar J. W. Hansen’s Winged Figures of the Republic on the Nevada side of the Dam. The bypass bridge, where I took the following picture. 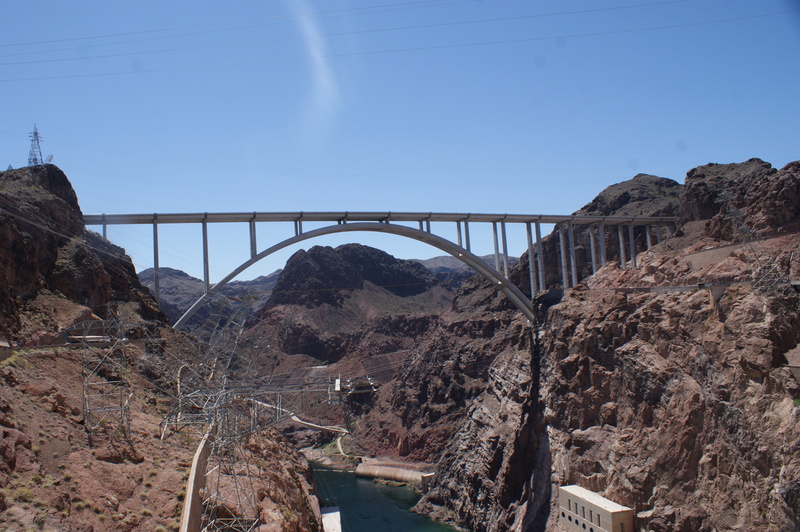 After spending some time on the dam, we drove and walked out onto the Mike O’Callaghan-Pat Tillman Memorial Bypass Bridge. This bridge, completed in 2010, was built to ease the flow of traffic over the two-lane dam roadway. The only picture I got of the whole dam (and a bit of the bridge). 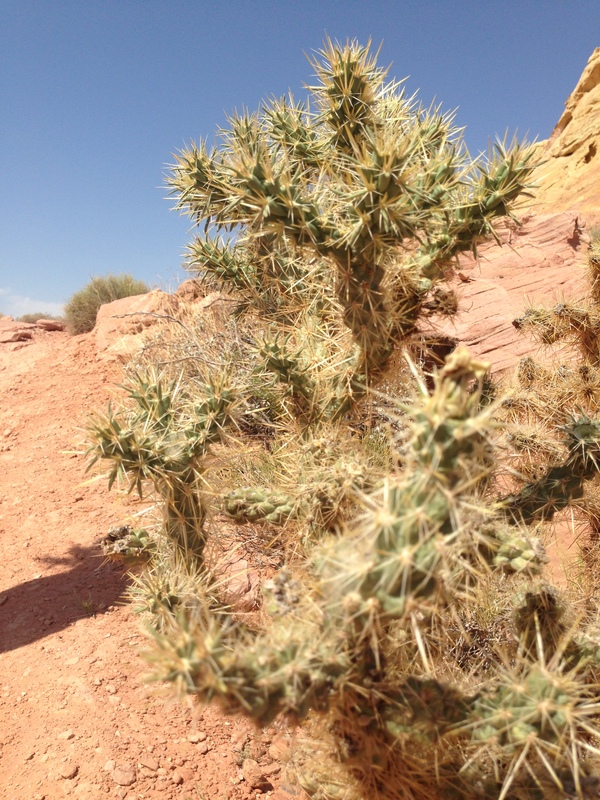 On Tuesday (4/14), we headed northeast to Valley of Fire state park. 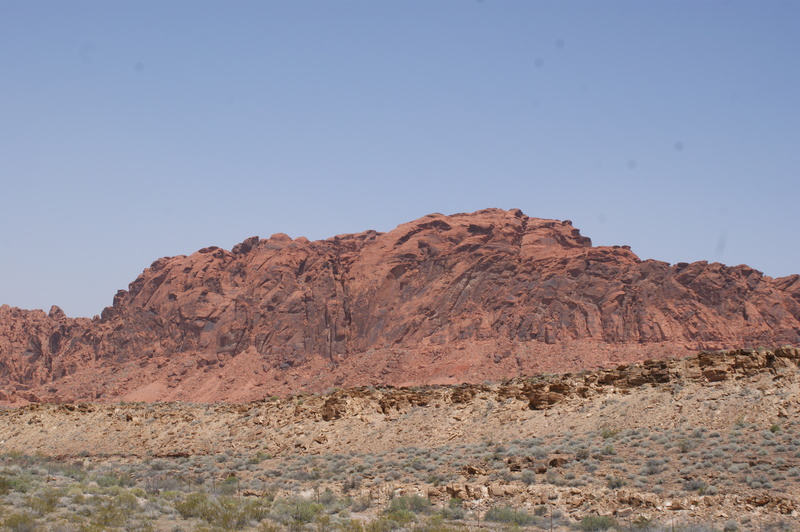 Dedicated in 1935, Valley of Fire was the first state park in Nevada. 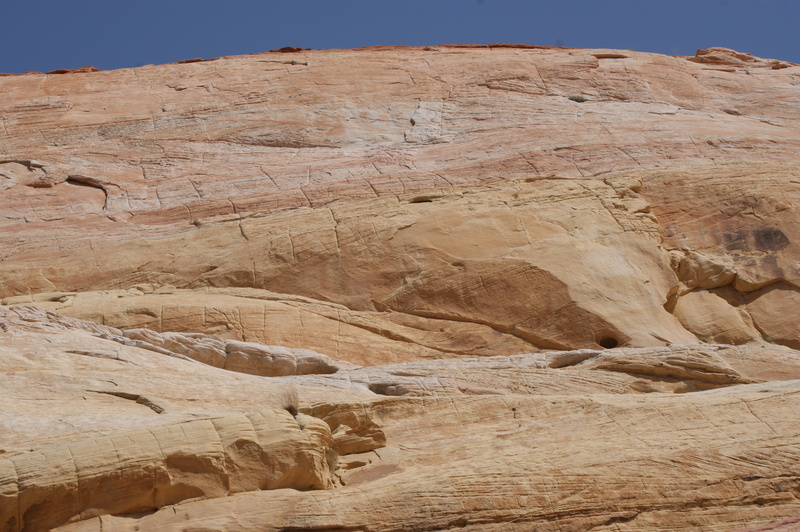 It has beautiful outcrops of flame-coloured sandstone, which give the park its name. Winnie in a mini cave. A tunnel right through the rock. We didn’t do much hiking here either; most of the interesting stuff was really close to the road. 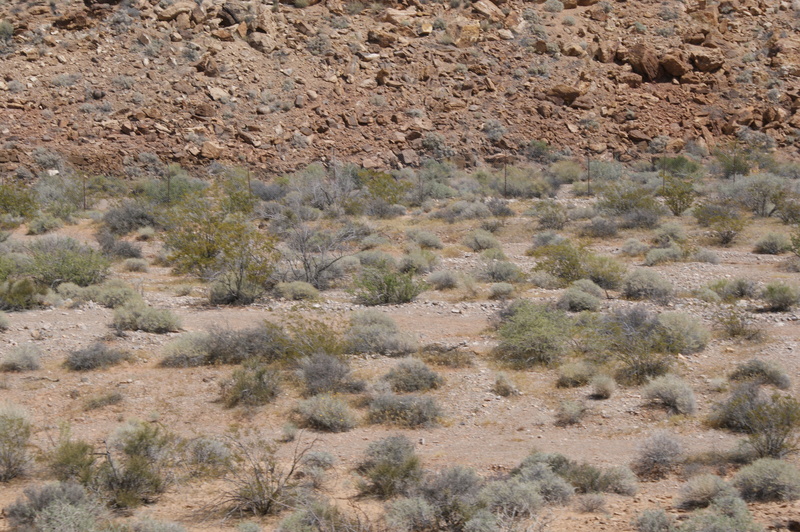 Desert scrub. Very little rain here. A higher angle on the same spot. After visiting the areas where the above pictures were taken, we drove out to another area, with a more reasonably-sized hiking trail. I still wasn’t quite well, so we were taking it easy. Everything we did could be done easily in sneakers. 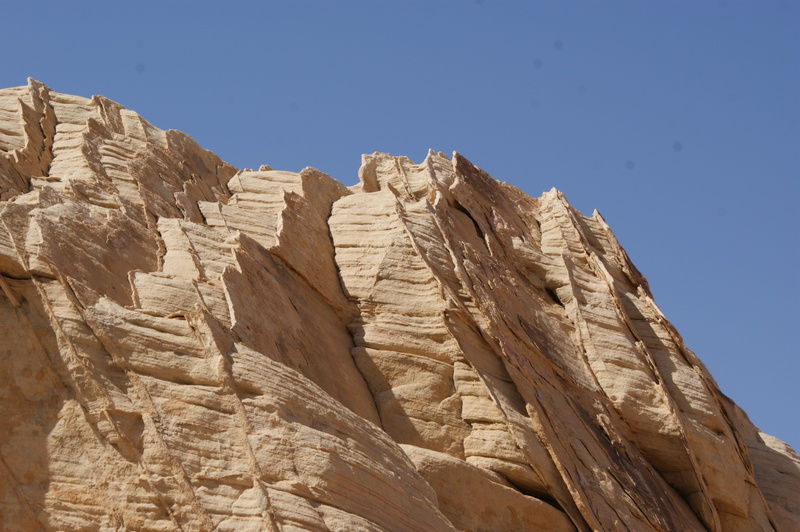 The view up a sandstone cliff. The pink band in the upper middle stands out a lot more in real life. Looking down the valley where the previous picture was taken. As you can see in the above photo, the rocks were very orange, and covered in places by a black coating which is actually a kind of lichen. 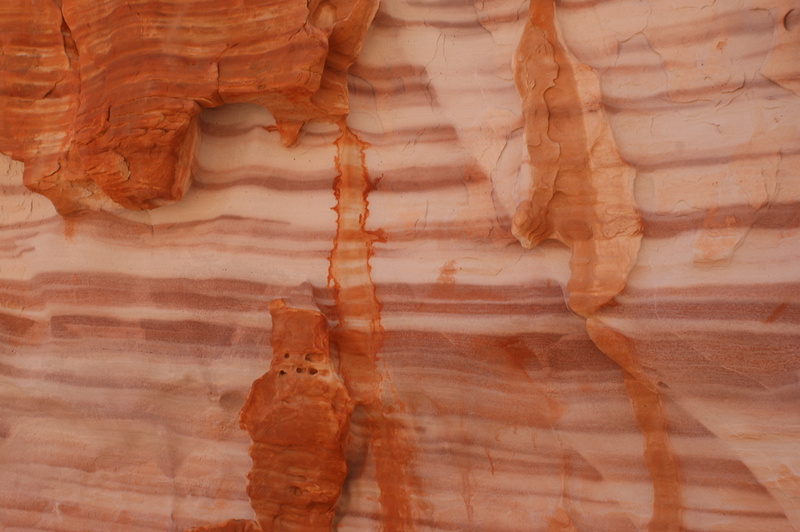 Pink stone stained red by the higher formations. Looking back. We came through the valley to the right of the wall. 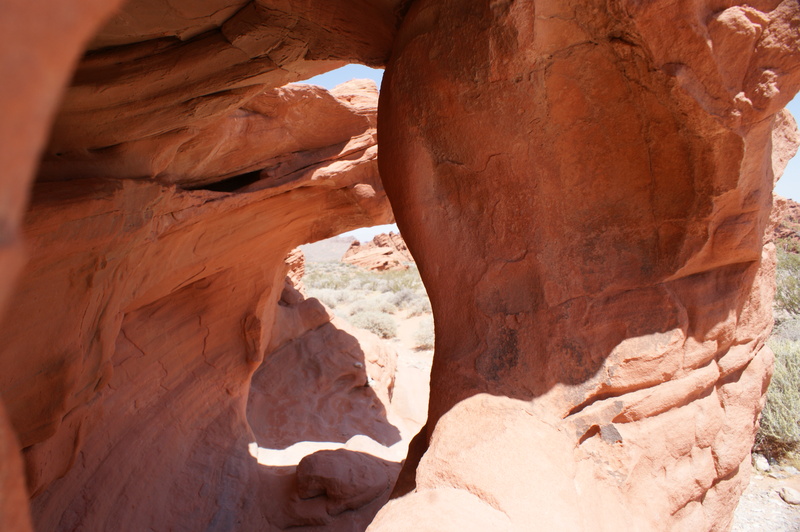 After passing through a beautiful valley, we turned and went into a slot canyon. 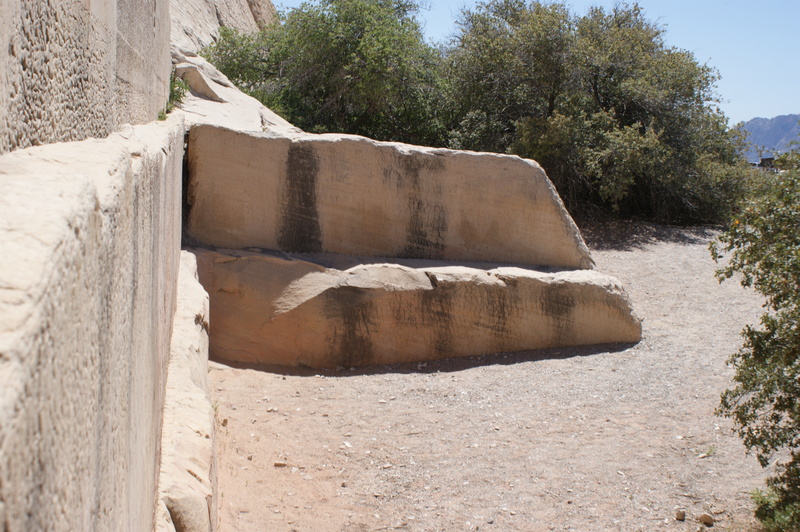 This is a very narrow passage in stone, sometimes many times taller than it is wide, eroded into the stone by water. 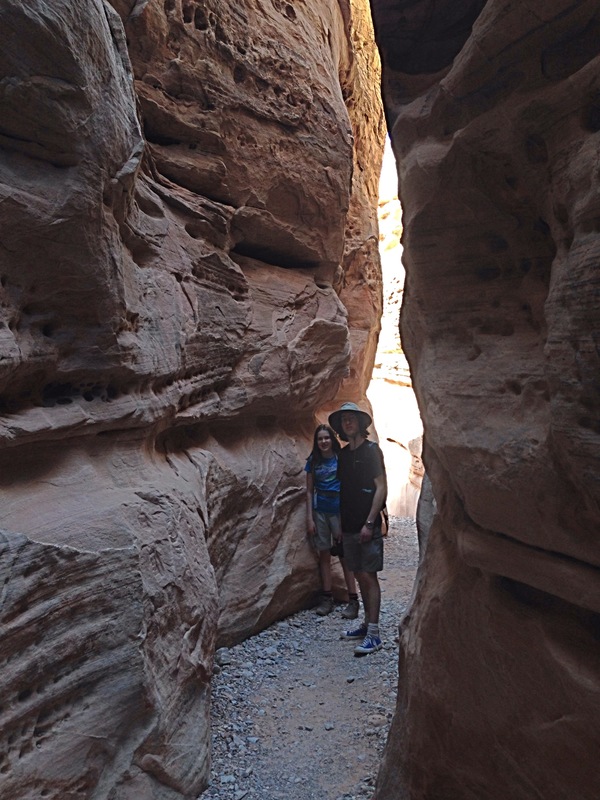 Winnie and I in the slot canyon. 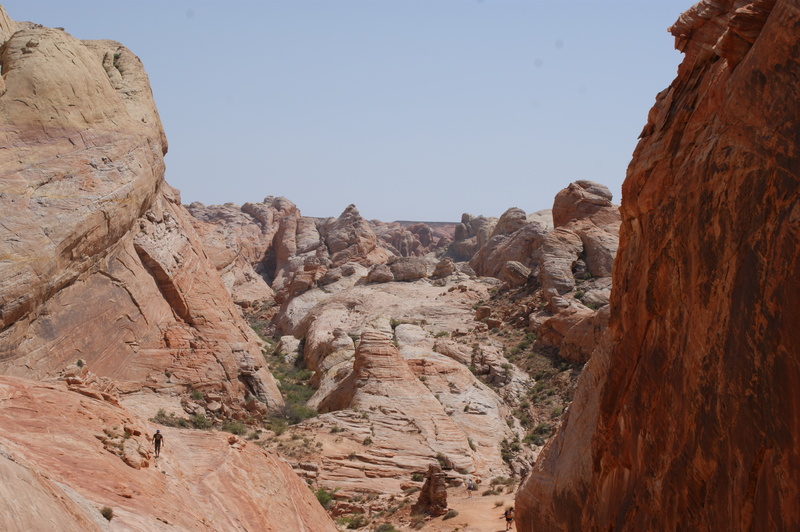 After we left the slot canyon, we continued along a loop back to the parking area, after which we left the park. Geology eye candy; pink, red, and yellow. I don’t know what caused this interesting erosion pattern, but i like it. 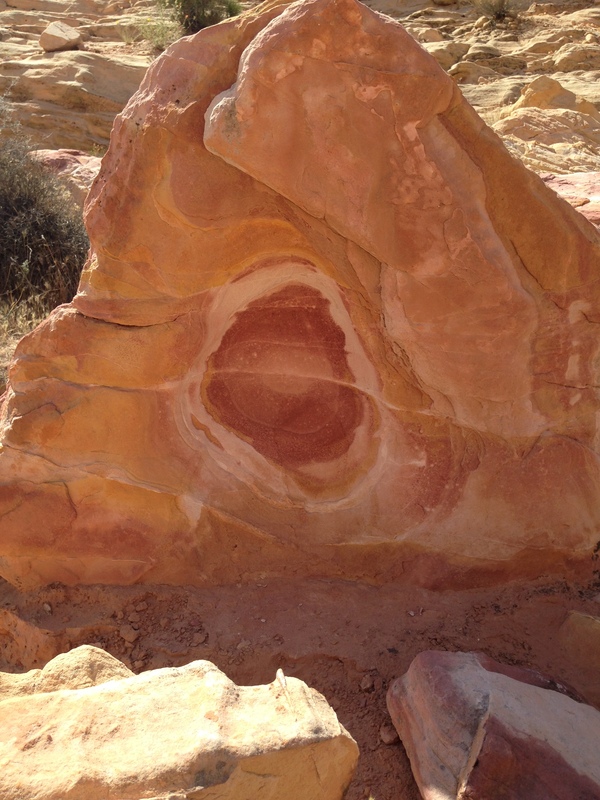 A rock with the red interior exposed. This post is getting really long with all of the pictures, so I think I’ll leave off here and post about the next day on Monday. 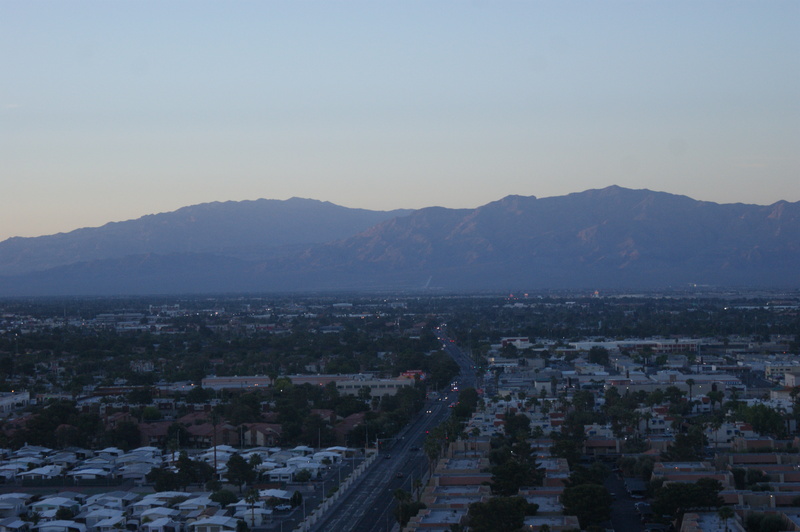 Bonus: Sunset over the mountains, seen from our hotel in Las Vegas. Etymology: From Arabic hashishiyyin “hashish-users,” plural of hashishiyy. The pluralizing –in suffix was adopted into the singular word for some reason. Definition: A person who kills someone of importance. Famous assassins include the trinonymous presidential assassins John Wilkes Booth and Lee Harvey Oswald, and Gavrilo Princip, whose assassination* of the Archduke Franz Ferdinand and his wife Sophie caused World War I. Others done in by assassins include Henry III and Henry IV of France, Alexander II of Russia, and rather too many Roman Emperors. Epics are full of tangents. Examples of this abound in literature, from the Odyssey taking time out for extended simile practise, to the Roman sequences in The Count of Monte Cristo, to the ballad of Luthien Tinuviel in The Lord of the Rings (such a tangent it made my mom quit reading), to the online extravaganza known as Homestuck, where, in some cases, the “actual story” is a tangent from a tangent. A mark of a well-told epic is one where even the tangents are interesting, which in my case would be Kim Stanley Robinson’s Mars trilogy, where there are large sections devoted not only to the science of terraforming Mars, but to economics, psychology, and sexuality.